MISSISSIPPI STATE – In the minds of many brides and grooms, the perfect wedding cake is one that acknowledges tradition yet reflects individuality, and most cake decorators can make the couple’s dreams come true. Cake decorators use skill, experience and creativity to turn the wishes of the bride and groom into a showpiece that draws the admiration of the wedding guests. The cake must look good, but it also has to taste good to succeed. 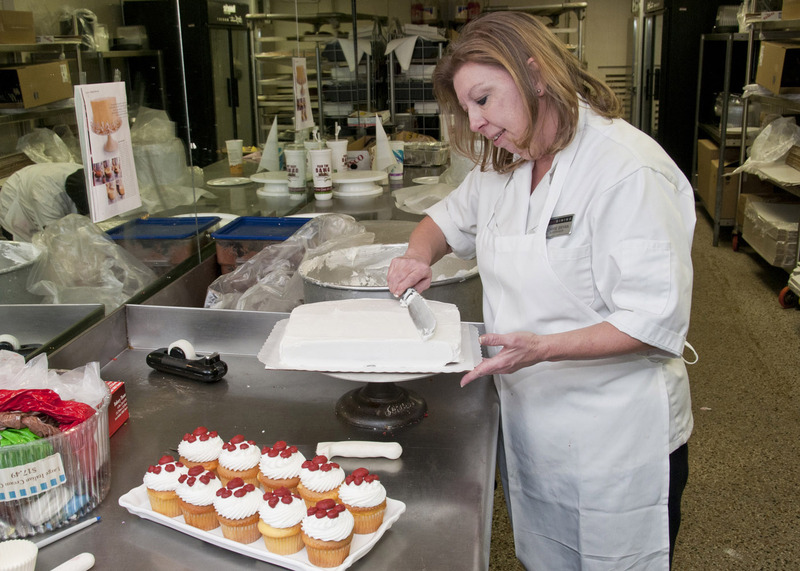 Behrends coordinates the department’s educational effort to teach students how to combine culinary arts, food science and food technology to make the appearance and taste of food a pleasurable experience. Successful wedding cake designers base their business on the principle of food that is prepared to look as good as it tastes. The bride’s cake traditionally has been several tiers of plain, white pound cake covered with white, buttercream frosting and garnished with flowers, scrolls, scallops or ribbons. The clean, elegant, classic lines those traditional cakes exude are hard to surpass. Some brides dare to be different, however, and ask the cake designer to incorporate more color, flavor and fillings. Fondant, a sugary icing that resembles dough, gives decorators an additional option because it creates a super-smooth cake surface. It can be rolled, modeled, hand-painted and airbrushed. Fondant must be rolled into very thin layers and applied correctly to prevent wrinkles and air bubbles. Smoothing the fondant does take considerable time, but the effect is worth the effort, Taylor said. Other decorative food materials, such as modeling chocolate, gum paste or even cereal, make more options possible. Inedible bride-and-groom figurines that once topped most wedding cakes have all but disappeared. Fondant and other edible materials give the decorator an opportunity to create flower bouquets, monograms and symbols for the cake’s top tier. These cake toppers usually are edible. There are other choices available to couples who want both color and the traditional white bride’s cake. Cookies, cupcakes and candy can be decorated with fondant or icing and prominently displayed to highlight the wedding cake. Taylor said she has many requests for sugar cookies prepared according to the couple’s personal tastes. Cupcakes are even being used to fashion wedding cakes. The cupcakes are arranged on stacked tiers made from plastic, glass or other covered platforms. Couples can choose a variety of flavored batters, icing and garnishes for the cupcakes and satisfy many guest preferences.